Visitors to Kiskatinaw River Provincial Park will enjoy the scenic grasslands and have a good opportunity to view wildlife, such as mule deer, on the open hillsides. Bald eagles and other raptors can be seen regularly flying along the river corridors. Kiskatinaw River Provincial Park is located at the confluence of the Kiskatinaw and Peace Rivers about 10 km from the Alberta border. There is no road access to this park. 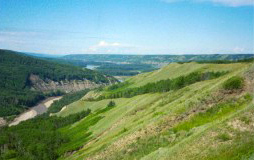 Cultural Heritage: The area has been traditionally used by First Nations of the Treaty 8 Tribal Association. Conservation: Kiskatinaw River Provincial Park conserves rare grassland vegetation in the Peace Lowland ecosection. A red-listed species, the fennel-leaved desert parsley (Lomatium foeniculacrum var. foeniculaceum) has also been recorded at this site. Wildlife: Mule deer, white-tailed deer and other ungulates frequent the open hillsides. Coyote, beaver and other small mammals are also common throughout the area. The area has a great diversity and abundance of songbirds such as warblers. The Peace River provides good opportunities for recreational kayaking, canoeing, rafting and power boating. Cycling is permitted but there are no designated trails. Helmets are mandatory in British Columbia. Visitors can hike through the area but there are no developed trails at this park. Horses and/or horseback riding are permitted. There are no designated trails. There are some swimming opportunities in the river. There are no lifeguards in provincial parks.